I have been packing and packing my house. Honestly, the more I pack, the more I feel like I’ll never finish. Why is that? I should feel like I’m making progress. I guess packing just reveals how much stuff I really have. It’s kind of scary not to mention boring. Anyway, packing makes me hungry. I’m trying to use things up from my pantry, fridge and freezer so I don’t have to move them. I want to start fresh somewhere else. I don’t want to bring 50 half-opened bottles of oils and vinegars. I started nosing around the pantry…cannellini beans, white wine vinegar and olive oil. The fridge…fresh rosemary, romaine and pancetta. Then there was the Dutch Crunch roll on the counter calling me by my first name. It was. I heard it. What I came up with was this Pancetta & White Bean Salad with Rosemary-Garlic Vinaigrette. It was very, very good. I baked the pancetta and bread in the oven to make it a little crispy and added this flavorful vinaigrette. It was the perfect lunch. Very satisfying and visually appealing. 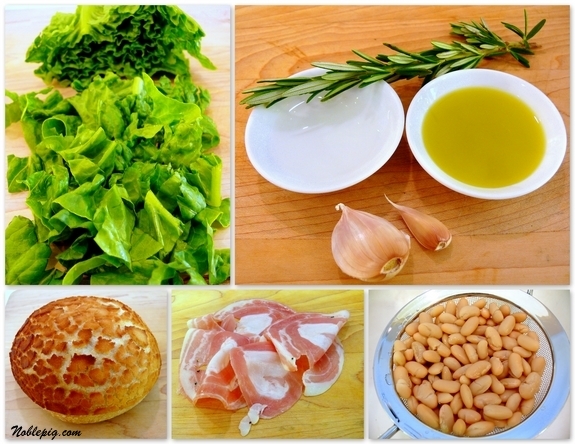 Here’s what you will need: Romaine lettuce, fresh rosemary, garlic, white wine vinegar (in the bowl that looks empty), extra-virgin olive oil, pancetta, cannellini beans, any type of crusty bread, coarse salt and pepper. In a small bowl tear apart a small to medium sized crusty roll. Size will depend on how much bread you want in the salad. Toss bread with 2 Tablespoons extra-virgin olive oil, 1 teaspoon chopped fresh rosemary and season with coarse salt and freshly ground pepper. 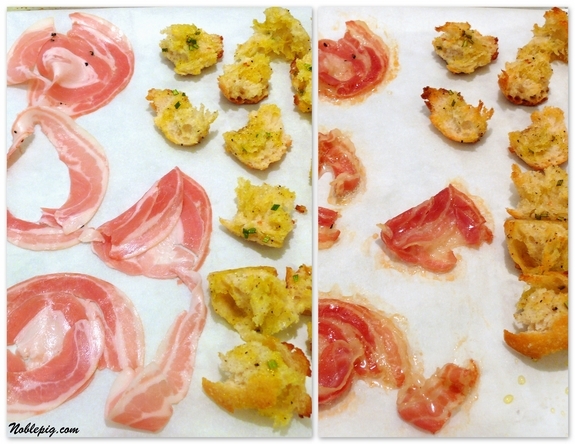 On a large baking sheet covered with parchment paper, arrange 5 or 6 slices of pancetta along with torn pieces of bread. Place in a 375 degree oven and bake about 10 minutes. Pancetta should be crispy and the bread golden brown around the edges. Let cool completely. In a small bowl whisk together remaining 2 Tablespoons extra-virgin olive oil, 3 Tablespoons white wine vinegar, 1 teaspoon remaining chopped fresh rosemary, 2 cloves crushed garlic and salt and pepper to taste. Add the dressing to 1 head chopped romaine, 1/2 cup cannellini beans, baked bread and pancetta. This is the perfect start to any meal but it’s also a meal in itself. There’s enough to serve two but I ate both servings. Oops. There’s no hope for me. On a large baking sheet covered with parchment paper, arrange pancetta along with torn pieces of bread. Place in a 375 degree oven and bake about 10 minutes. Pancetta should be crispy and the bread golden brown around the edges. Let cool completely. In a small bowl whisk together remaining 2 Tablespoons extra-virgin olive oil, white wine vinegar, 1 teaspoon remaining chopped fresh rosemary, garlic and salt and pepper to taste. Add the dressing to romaine, beans, baked bread and pancetta. As always, it looks really good! You must be so excited to move forward! I don’t think you can make anything that is not beautiful to look at. I know you can make something from nothing. I think you’re a witch! I would have finished both servings too!!! What a delightful salad this is!!!! Cathy .. good luck with the packing .. it’s the residue that always worries me at the end .. I agree finishing everything up – makes absolute sense. The salad is the just the sort I love .. The salad is pretty! I think I would call it that too, “here, do you want some pretty salad for lunch dear?” Anyway, everything you listed is easy to get this time of year and easy to put together…and did I mention, it is also pretty? This salad is a masterpiece:) Looks so fantastic, its amazing how you get everything to look so damn delicious. Id come for dinner any night, really. Thank you. I am envious. You just grab stuff and throw it together and you have a beautiful and delicious salad fit for the Queen. Not to mention the fact that in the middle of everything your packing to move and find the time to post everyday. The fact that you are blogging and packing to move at the same time puts you in “Superhero” Status! I won’t even mention the fact that you are still eating healthy! I think if I were in your position – a few trips to the Micky D would be in order! You go girl! Oh that looks so wonderful! I love every single ingredient on the list. And I wish I could help you…I have an odd love of packing. That looks good. Really good. Perfect for a meal! The more I visit, the more I learn. I don’t have or buy (purchased in a box) croutons. Love the oven crisped roll. thanks. I love these types of salads which have the crusty bread to soak up some of the dressing. This looks fabulous. My husband always says we shouldn’t get too much stuff in case we move. oh wow, as usual that looks very yummy Cathy! You need to persevere to pack – and yes it is very boring! I just moved a year and a half ago and I understand the packing and packing and packing and feeling like the end is very far away. We donated so much stuff to the Goodwill and the dump. That was very satisfying! That looks very tasty!! Good luck w/ all the packing–I don’t envy you–but in a way I do b/c I just want to get our house sold and get packing and get out of here! Packing is such sweet sorrow. Oh sorry that was parting wasn’t it? This is such a satisfying looking salad and one that could be varied so many way depending on what was taking up space in the fridge. You make it look so doable. Nice salad; love the homemade croutons! Miraculously, I have everything in the house for that, and it sounds wonderful…even for breakfast. Darn it, I just might do it and use the Irish bacon I got at the British store. I do soooo love your photography. What a task you have ahead of you but how exciting none the less. I hope it’s smooth sailing for you!!! Salad looks so good. You take the best pictures. I was just feeling irritated last night that a healthy single serving takes a terrible picture. You really need to double it or it looks mean and skimpy. Your salad looks terrific. I wish I had everything in my house to make that for lunch today. Good luck with the packing. It looks really wonderful, but I’m concerned about the bread talking to you. I guess it’s okay as long as it says nice things. The pictures are so beautiful I could cry. It looks so delicious! Love the rosemary-garlic and making my own croutons is something I need to do! Mmm That looks divine! All of my favorites! I don’t like packing either. This salad would make it a little better. It looks really good. Now that is how a crouton should always be! Lovely salad! Delicious with pancetta and white beans! The salad looks so tasty, especially the bits of brusty bread. I’ve moved five times over the past two years (twice to a different country). I’ve gotten rid of so many nonessentials each time to make it easier, but I always seem to have so much stuff! Totally a meal in itself. That’s a good way to cover all the food groups. This looks wonderful – it’s exactly what I’ve been craving. I’m loving the salads! You are so awesome to think of keeping us all entertained while you’re getting moving. I can’t believe you cook like this while packing! Another good sounding recipe. Great photos again. LOL, it’s a salad, so eating both servings was double good for you…. How do you do it!! You are amazing!! I can’t even put together such a lovely salad when I’m not packing. Looks so good! I’m afraid I would have eaten both servings too. Oh, yum. I’m not a salad person, but that has me drooling! Very creative and looks delicious! My husband has been asking for salad. This one looks better than perfect. That looks AMAZING & cheap!!! I’ll definitely be making this! 🙂 I also read yesterday about your peach margarita.. I’m thinking about making it with strawberry margarita mix… YUM! Looks yummy-now I’m starving too. Yum! I wish I was eating this right now! That is what I call a MEAL! The mark of a really great chef is someone who can conjure a delicious meal out of thin air. A friend of mine did this at my house once out of my pathetic pantry and I was floored. So if I come help you pack will you feed me that salad? The only thing that could make this salad any better would be waiting until August to add an avalanche of fresh homegrown tomatoes. My favorites include: Northern Exposure, pineapple, stupice, black prince and of course sungold. This salad looks so fresh and delicious! I almost picked up some pancetta today and then decided to wait. Wish I hadn’t now! Love the addition of crusty bread! Looks sooo good! Wonderful combo. I swear I have the most one-track mind ever. I was trying to concentrate on your post and the tasty recipe, but my eyes rested on the photo of the pancetta and refused to move for two minutes! I don’t blame you; eating both servings. I love this creation. Very light, yet satisfying. I am rather excited about this move…I can not believe it is so close now! this recipe will be used this week for a bring to for Church…it will work well into the theme!!! You rock and I have missed you so! The crusty bread with the olive oil looks so good. I’d like to sink my teeth into that right now! OMG Cathy, I can believe how delicious this simple salad can be. I would serve this as a meal for sure. This is truly a lovely salad, Cathy — simple and delicious. That crusty bread is totally calling my name! S-U-M-M-E-R! I really like the idea of beans in salads for all that nice extra protein. Hang in there on the packing. You are making progress even though it may not feel that way! I ALWAYS eat both servings–does that still count as an oops? What a great idea; simply is always the solution, isn’t it? Good luck with the move! The salad looks delicious, especially those croutons. This is an absolutely beautiful salad! Good luck with the packing! In Feng Shui too much stuff is blocked energy. I tried to get rid of 9 items a day for 9 weeks. Of course, I brought new stuff in. You make me want to eat vegetables. I can’t quit you. Happy Mother’s Day, Noble Pig! Oh baby . . . and it even goes on the flat belly diet! OMG this salad is so similar to a salad I had been enjoying at Le Pain Quotidien. I went to order it the other day and they told me that they didn’t make it anymore, that it was a special they had. I was devastated. But here you are posting a recipe for an almost identical salad as theirs. Thank you so much!!!! Cannot wait to go home and make it. I love this salad and crave it at least once a week. I must be deficient in something or maybe it’s the pancetta. I need to shorten the prep time so i just fry the pancetta and croutons up in a pan on top of the stove. I keep the dressing on hand and I make sure I always have fresh rosemary and a can of beans on hand. Thank you! i just love the recipes on this site! Lots of persons know techniques of comparison contrast essay writing, nevertheless that doesn’t mean they would accomplish really good essay papers, however a sociology essay service can help to create the term papers of great quality and show writing skills of students.